Technical masterclass from the Dutchman denies second-place Van Aert a fourth consecutive world title. 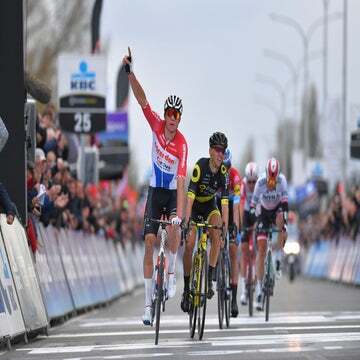 Mathieu van der Poel (Netherlands) exploited his technical prowess to pressure others into errors and ride to victory in Bogense, Denmark, Sunday. Reigning world champion and season-long adversary Wout van Aert (Belgium) survived a late-race comeback from teammate Toon Aerts to take second place. After a muddy women’s race on Saturday, the cold, dry conditions on Sunday made for a hard, fast course, with the gravel used to clear the ice from previous days still littering some sections. Van der Poel set the tone for the race from the start, going out exceptionally fast and leading the pack over the opening bridge. A select group soon formed at the front of the race, made up of Van Aert, Quinten Hermans, Michael Vanthourenhout, Toon Aerts, Larurens Sweeck (all Belgium), Lars van der Haar, Corne van Kessel (both Netherlands), and Felipe Orts Lloret (Spain). In the initial laps, it was clear that the Belgians and Dutch were riding as teams rather than individuals, looking to work together to pressure their opponents, while lone Spaniard Orts Lloret clung on at the back of the group. By lap three, the pace had whittled the lead group down to three Belgians and two Dutchmen: Van der Poel, Van Der Haar, Van Aert, Toon Aerts, and Vanthorenhout. Van der Poel showed his confidence and skill in launching his first move in lap four, accelerating through the transition from a steep off-camber bank. Aerts, then in second, slipped and lost vital seconds. 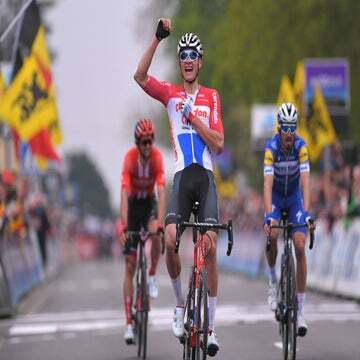 Van der Haar negotiated the section successfully and sat up to slow the chase of the three Belgians, allowing Van der Poel to go clear by a few seconds. Aerts drove the chase through the remainder of lap four before Van Aert accelerated away, hunting down Van der Poel, who was five seconds clear at the close of the lap. After his efforts driving the pace, Aerts fell away slightly, with Van der Haar and Vanthorenhout passing him. Through laps five and six, the race slowed slightly after such an intense start, with Van Aert coming back to Van der Poel, and a chase group of Sweek, Van Kessel, Vanthourenhout, Van Der Haar, Aerts, and Oorts Lloret coming together, 25 seconds behind the lead pair. In lap six, Van der Poel again attacked on the off-camber bank he used previously, and Van Aert stumbled, losing valuable seconds. The Belgian chased hard through the following laps, though Van der Poel’s technical skills allowed him to continue edging out his advantage. While the Dutchman didn’t put a foot wrong, Van Aert was left making minor mistakes every lap that cost him time and added fatigue. On lap eight, Aerts had attacked out of the chase group, which was now around 40 seconds behind Van Aert, who looked to be fading. Aerts gained ground on his fellow Belgian, and by lap nine, the pair were within 20 seconds of each other, while Van der Poel continued to stretch his lead at the front of the race to toward 30 seconds. Aerts caught and overhauled Van Aert on lap 11, leaving the two Belgians together chasing down Van der Poel, who continued in his trademark relaxed, efficient, and faultless style. Aerts looked to be distancing Van Aert in the final lap, only to lose his grip on a silver medal when he slipped and fell cornering out of a descent, allowing his countryman to ride clear. At the head of the race, Van der Poel was able to ride out the final sections of the closing lap with relative ease, safe in the knowledge that he had taken his first world title since 2015 in Tabor. He crossed the line in 1:09:20, 16 seconds ahead of Van Aert. Aerts crossed the line nine seconds later. Curtis White led the Americans home in 21st place, while Kerry Werner and Stephen Hyde finished 31st and 32nd respectively.